SARVEPALLI RADHAKRISHNAN (1886-1975) scholar, biographer, philosopher, educationist and statesman were among the few people in world history who though being a professional philosopher of eminence rose to be the head of a vast country. 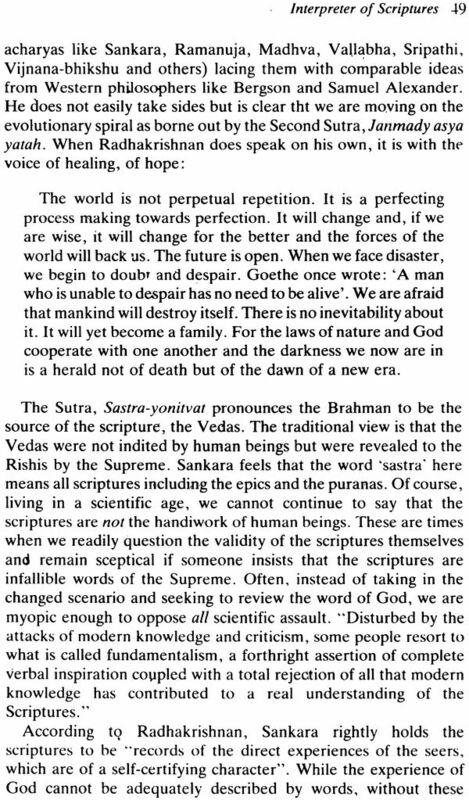 Author of scholarly works in Indian philosophy and culture, it was due to his tireless effort that the East recognized the need to master Western science and the West realized the to understand Indian Philosophy as the way to "inner peace". Extraordinary felicity with the English language and Sanskrit make his writing a connoisseur's delight; because of this, a large section of educated Indians, who had no formal foundation in Sanskrit scholarship, became aware of their rich philosophic heritage. 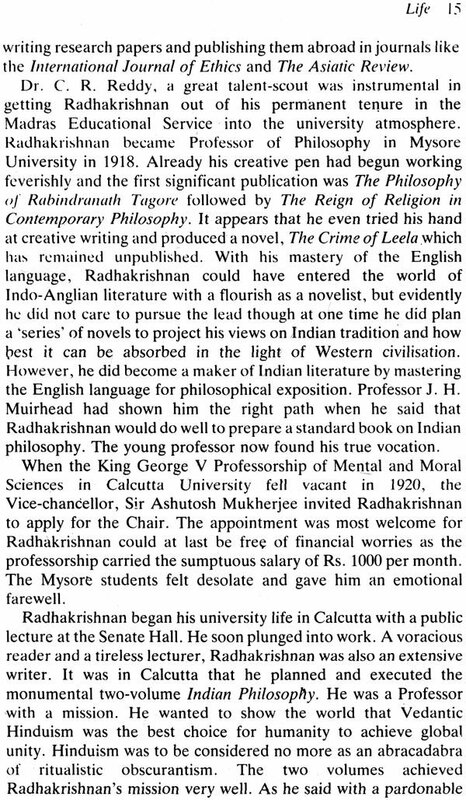 Radhakrishnan's life-long commitment to education continues to influence the Indian academic community. A staunch supporter of university autonomy, his convocation addresses repeatedly exhorted institutions to use India's rich cultural past as a means of achieving social transformation. Radhakrisnan also gave intellectual leadership to eminent literary bodies like the PEN All -India Centre and Sahitya Akademi, of which he was elected President in 1964. A Knighthood was conferred on him in 1931. He was also awarded Fellowship of the Royal Society of Literature, London in 1953 and that of the Sahitya Akademi in 1968. As a statesman he has held the posts of Indian ambassador to erstwhile USSR, the Vice-President and later the President of the Indian Republic. PREM NANDAKUMAR (b.1939), the author of this monograph, is a writer and critic in Tamil and English, with many published books and numerous articles. Sarvepalli Radhakrishnan has an assured place among the ‘Makers of Indian literature’ for he was only the finest philosopher-statesman of our times but a powerful writers in English. Indeed, it was his mastery of the English language that facilitated his becoming a world-figure. 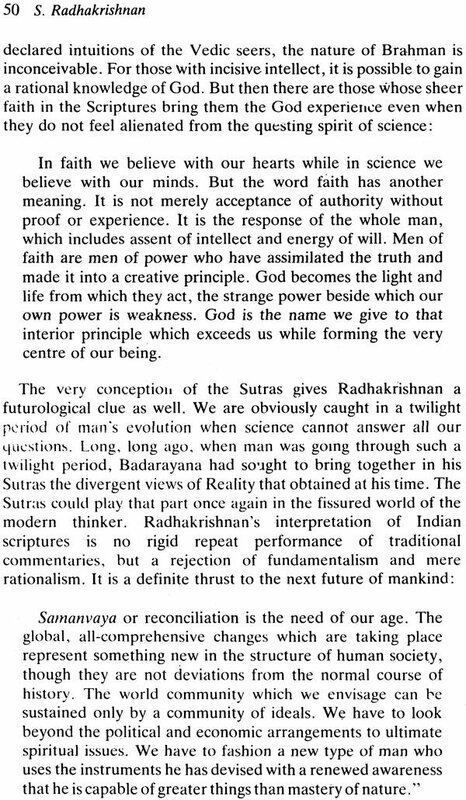 He could interpret the rich and ancient Indian religion, philosophy and spirituality with masterful ease to western audience through his sonorously-tuned English that was enriched by Sanskritic phraseology and movement. Radhakrishnan was a felt presence in the corridors of the Andhra University where I studies for several years. The university library which has been nurtured by him in its early years was an inspiration. It was a pleasant surprise to be asked by the Sahitya Akademi to write a monograph on this great personality for the ‘Makers of Indian Literature’ series. I am thankful to the Sahitya Akademi for this great privilege accorded to me my homage to our nation’s Acharya. 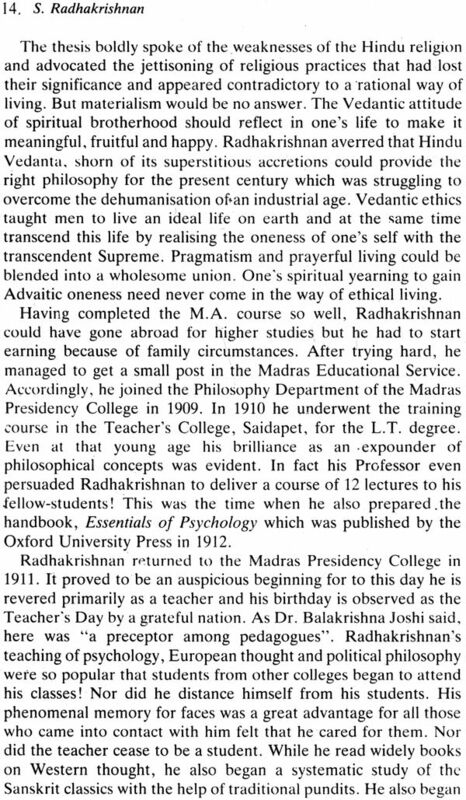 While Radhakrishnan’s writings have been the mainstay in drawing my conclusions, I have benefitted much by Sarvepalli Radhakrishnan’s biography of his father. Spontaneous and critical help form my father, K. R. Srinivasa Iyengar and my mother Sriamti Padmasani has sustained me throughout the writing of the book. My grateful thanks to them.